Are you looking for a way to promote healthy workplace ideas? Do you want to share the latest health and wellness findings with your employees? Are you trying to start a conversation about improving workplace wellness? If so, the health and wellness experts at Wellworks For You can help. We have a variety of unique programs which can help you and your company promote positive changes and healthy lifestyles among your employees. One of the most important aspects of any positive change in wellness is getting vital information to employees. Often, individuals today are too busy to spend the time researching health topics and discerning the reliability of sources; yet, this information can make a huge difference to their wellness and decisions. So, Wellworks For You provides a way to keep employees up to date with current health topics. These engaging monthly newsletters offer wellness articles, tips of the month, and even engaging trivia questions. Additionally, weekly email bulletins can help employees to stay up to date on current programs and challenges being offered. 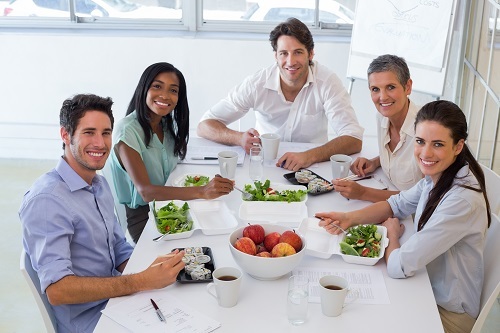 Corporate Lunch and Learns are one of the best ways to start a conversation about specific healthy workplace ideas. These on-site seminars last between 30 and 60 minutes, maximizing their impact in an efficient and accessible way. Wellworks For You will send a specialized health and wellness expert to come speak with your employees about a specific topic, which might be anything from smoking cessation to physical activity at work. This educational platform often includes time for discussion, allowing participants to engage in the topic on a level you won’t find with other programs. Sharing important information about wellness is only the beginning of promoting healthy workplace ideas with Wellworks For You. In addition to our Newsletters and Corporate Lunch and Learns, we have a range of other engaging programs available to employers like you. Whether you want to inspire change through a pedometer challenge or a smoking cessation program, we can help you manage both the program and the incentives which will really motivate participants. No matter what programs you choose, though, you can be confident that it will really engage employees. And because engagement is the key to success in any workplace wellness program, we feel confident that you will see a positive return on investment as well. For more information about what makes Wellworks For You different, contact us today!